Glossary: Who Is Telling the Story? 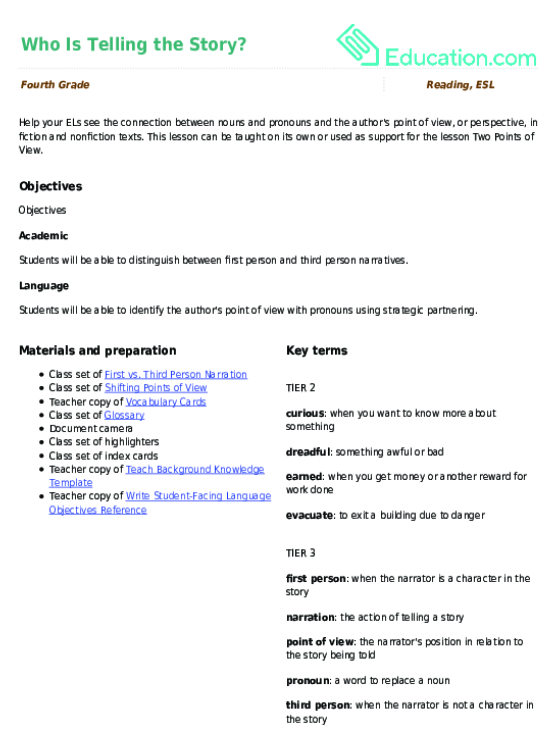 Use this glossary with the EL Support Lesson: Who Is Telling the Story? Vocabulary Cards: Who Is Telling the Story? Use these vocabulary cards with the EL Support Lesson: Who Is Telling the Story? Help your ELs see the connection between nouns and pronouns and the author's point of view, or perspective, in fiction and nonfiction texts. Here's a snapshot of the story of Orion. His tale makes for light reading and simple practise with story structure for kids. Use this glossary with the EL Support Lesson: Character Comparisons. Use this glossary with the EL Support Lesson: Personal Timeline. Use this glossary with the EL Support Lesson: Characters and Settings. Use this glossary with the EL Support Lesson: Read with Expression! Use this glossary with the EL Support Lesson: Discovering Character Traits.